Today we learn a lesson about disappointment. Tyr hails from Tyrraz, a planet-sized, mobile warship with a culture devoted to combat. His tactical cunning and great strength alone would make him a deadly adversary, but Tyr also replaced his right arm with a sentient mechanical appendage and blaster cannon. His gun-arm not only delivers massive energy bursts, but it can also exert a form of mind-control. In the event that Tyr is injured or unconscious, the arm can fight on its own, even detaching from his body to protect him or avoid capture. So this is Tyr. Tyr the Terrible, Tyr the Hunter, Tyr the "only made because of the Four Horsemen's love of the old Super Powers line, and if you'd been paying attention and realized this figure didn't come with a BAF part you wouldn't have had to buy him, like the useless Batman repaint from Series 10." But that last nickname is a bit unwieldy, which is why most people just call him "Tyr." Pronounced "tier," not "tire." 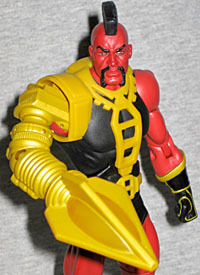 Tyr was designed by Dave Cockrum, who apparently spent a lot of time on Legion of Superheroes before becoming famous for helping to save the X-Men from cancellation. 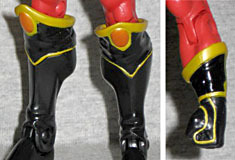 The costume is ornate enough that Mattel had to spring for new molds: though the torso and thighs are usual fare, his knee-high boots mean the shins are original creations, and no one immediately comes to mind for future re-use; his left forearm is new, to accommodate the glove, and though you may overlook it, the hand is new as well. You can tell because the yellow lines are sculpted elements. The Horsemen have also decided that the yellow designs on his shirt are a separate element, not just part of the costume. Then there's the arm. 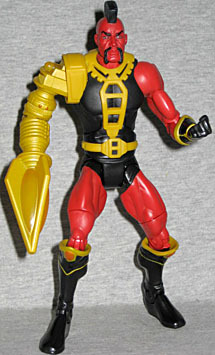 Tyr has a bright yellow robot arm hanging off his right shoulder. Why? Because he's named after the one-handed Norse god of war, Týr, the guy who comes after the moon but before Odin, Thor and Freya in the days of the week. The design of the piece isn't based on his first appearance, but rather on whatever art it was that inspired the Super Powers toy. The detail in the sculpt definitely takes its cue from the old design, but pulls it off with modern flair. It's more proportional, and looks like something someone would wear on their body, rather than an action figure accessory. The bulb in the "hand" and a spot on the shoulder are translucent, but the rest is painted solid. Tyr's skin is a bright magenta, just as it was always shown in the comics - granted, in his first appearance he was closer to orange, but that was 1973 and colors didn't always react the way they were meant to on the crappy paper comics were printed on. Still has the right tint, though. There's allegedly also a variant that has darker skin, closer to purple, but the bright one looks better. You already know how every DCUC figures moves, so there's no point in listing those joints yet again - what you want to know about is the robot arm. 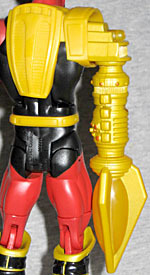 The shoulder is a swivel/hinge joint, just like the left arm. The "bicep" area swivels, as does the "wrist." The elbow is a swivel/hinge joint, like Hasbro figures have. Several of the joints are tough to get working when you pull him out of the tray, but believe us, the joints do exist. Throw him in the freezer and work at them until they move freely. Gotta say, though, considering how much DCUC loves to ape Super Powers, we're surprised the arm isn't removable - you know, to duplicate the "Power Action Rocket Launch" the old toy had. Like we said before, Tyr doesn't have a BAF piece. He does, however, come with one of those plastic DC 75th Anniversary collector buttons. Tyr has only ever appeared on three comicbook covers, and none of them are this art. It's that right combination of dull and pointlessly dynamic that suggests it may have been promo art at some point. Tyr is the obligatory "Super Powers throwback" figure for DCUC14, and he doesn't come with a part of the BAF Ultra-Humanite? That's a recipe for being ignored. The figure itself isn't bad, but since he's a LOSH villain, and the only way to get the Legion is in the sure-to-be-too-expensive online box set, he's going to be lonely. I don't regret getting the guy, but he's not one of the must-have releases.